KMS 316 Stainless Conveyor ball bearings feature our standard ball bearing construction for light weight, free turning to meet the demands of today’s low incline conveyors. Made from corrosion resistant Food and Medical grade 316 stainless, they can be washed down, becoming maintenance free and requiring no lubricant. 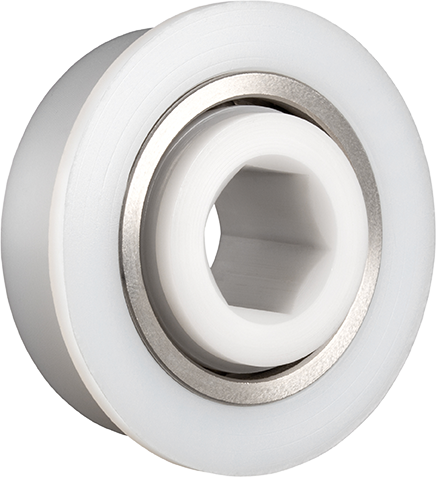 They can be used in standard industrial tube and pipe sizes for use in conveyor systems. See chart below. 1" PVC, 1" ID x 1.315 O.D., 1" PVC, sch. 40. Double row (DR), Plastic or 316 Stainless races. 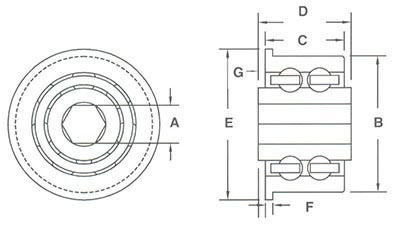 This bearing and tube guide is intended to be a practical guide for selection. Consult with tube/pipe manufacturer for actual dimensions held in production lots.